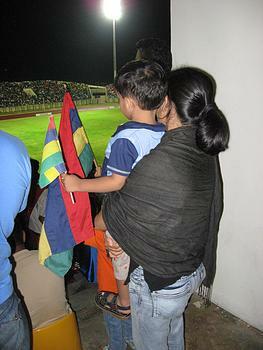 We were all thrilled to be at the Anjalay Stadium on 21 March to watch Didier Drogba’s national team, Ivory Coast, playing in a friendly against our own Mauritian national team. I was sure that we were going to draw with the Ivory Coast. Of course, we were not going to beat them but I felt that with the proper tactics we could nullify the presence of Didier Drogba, Salomon Kalou, Didier Zokora, Kolo TourÃ© et al. But I was wrong. We lost 0-3! There were a lot of other negatives during the match. One was the lack of information about the players. We did not know who was playing. The MFA should have distributed an information leaflet. There was no public announcer. In fact, the atmosphere was not great (compared to the few past international matches I’ve been)! As always, the scoreboard was not working. Consequently, I only knew who scored this morning when listening to the radio… My feeling is that the organisation was extremely amateur. One extremely positive aspect was that we were having the opportunity to watch a world-class team of football players in front of us. 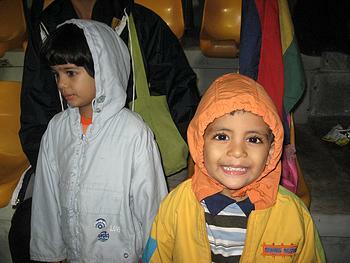 Kyan and Anya, who were watching their first ever real football match, were delighted. You should have heard them singing the national anthem at the beginning… I was so proud of them. Ashvin and Jyotish also came. Can you see how Jyotish is being sarcastic? Mauritius was not beaten by Ivory Coast. 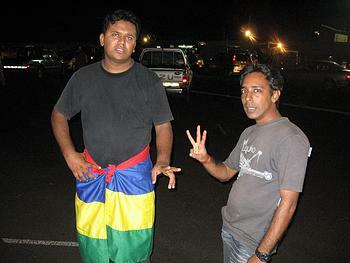 Mauritius was beaten by its own amateurish behaviour. The next World Cup is in South Africa. Naturally, a small country like Mauritius cannot qualify (even if similar-sized countries have qualified in the past). But we should really capitalise on the event. Mauritius must become the training ground of top teams like England, France, Brazil etc. This will boost our morbid economy! But this requires a perfect organisation (not to say a perfect canvassing campaign). After watching yesterday’s match, I have some doubts about our capacity to organise such a major event. Let’s hope private Mauritian companies can seize this opportunity. We need the money. Amen! “…the organisation was extremely amateur”…you’ve got the right words!!! I personally don’t think Mauritius has whatsoever calibre of organising any other higher class tournament other than “Les Jeux des Ã®les de L’OcÃ©an Indien” or “Les Jeux d’Afrique”. Harsh words you say! !…but I think many will agree on this point. Regarding the match itself, I would have preferred Mauritius playing a regular 4-4-2 rather than that ferocious defensive mode. I simply think that the Mauritian team didn’t have the legs on the night to cause any sort of damage to the Ivory Coast defense. Lets hope to redeem ourself on Sunday against Soudan…Hope for the best! It was a gala match anyway and it provided dreary Ivory Coast players some bonding and match practice together before their African Nations match against Madagascar on Sunday. I dnt thk so..we CAN organise provided we get the right persons…it was a bunch of amateurs who eventually created this chaos after the match..should let go this attitude of “privilegier les copains”. How come all these people were on the field when Drogba was being awarded a trophy? Saken pli “VIP” ki so camarad!!! That’s why I want the private sector to get in. I’m looking forward to having our National ‘goalÃ©adors’ score against the Sudan. At least a draw (mais pa zouÃ© un ‘batte boule, casse boule devant’ as has been their style against the Cote d’Ivoire)! It’s obviously true that the Mauritian team does not have the finesse of a real national squad as it was say a decade ago when we nearly went through to CAN 2000.
duh..was much disappointed by the game yesterday..
u could see that the mauritian player we tired/dissapointed after that accidental own goal..
nevertheless..they shouldnt have lose hope..
anyways..the victory of sudan yesterday was not a deserving one..
am not much into football myself..
which reminds me y i quit playing football..
once in college..we were playing..a full speed mikasa ball end its course on my face..and i was K.O..
since then i kinda have a phobia..
one day i shall play again..
mauritian team is sooo amateur. 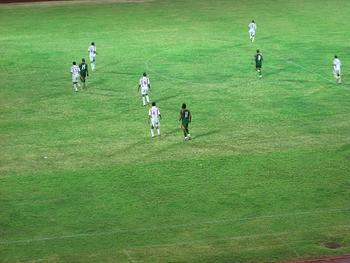 we have to improve z tactics of football otherwise football will not become popular in mauritius. football must be organise like b4, scouts, fire, sunrise etc, zen football will bcome amazing. all zat i have 2 say is dat football must b played with mind. we have two legs like z Ivory coast n z ball is alike n z pleyground 2. y can’t we play like them???? its just the lack of tactics. ze mauritius selection team is not enough as u thought. zers better player around the island. just go n watch around z island how many good player there are. so let them get their chance also so zat we can have a better maritian team. pas fier seulment lor creol……….. I agree with this. 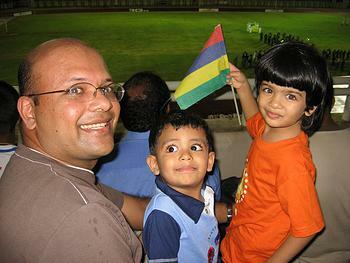 Mauritius need some structure in their academy and more money and awareness needs to be put into grass roots football. Talented players from schools should be encouraged to keep playing not just go to tuition all the time to become doctors!